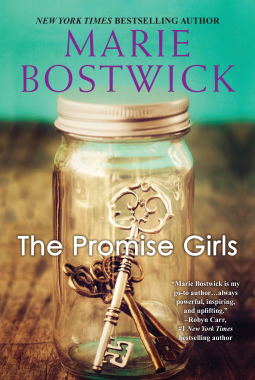 What They Say.....In an emotionally rich and captivating new novel, New York Times bestselling author Marie Bostwick reunites three sisters whose deep bond is rooted in an unconventional past. What I Say.....So coming off The Roanoke Girls, I was ready for a lighter sister read. The Promise Sisters wasn't an easy, breezy read, but it wasn't completely dark. Minerva Promise was raising three test tube babies into being prodigies of the arts, and making her living writing a book about it. On the day that they have their debut on a major talk show, Joanie decides to make a break for freedom and flub her music performance, earning her a face slap on national TV. Chaos ensued and the girls are split up and put into foster care. As they age out of the foster system, they find their way back together, with Minerva a bad memory for the older girls. The youngest Promise girl, Avery is the one with the most contact with Minerva, via infrequent phone calls. But Avery is also the most mixed up. She lives in a tiny house in her sister's backyard, she is half unemployed, but lives in a separate persona as a mermaid, and chooses a series of wrong men. After Meg loses her memory in a car accident, the girls rally around to help her recover. But with her hospital bills comes a deal with the devil (I'm still wondering why her car insurance didn't cover her bills), Joanie has to agree to have a documentary made about them and the fateful talk show appearance, something she has been flatly refusing for a long time. Hal comes to town to film the documentary, has been half in love with Joanie since he met her on the set of the talk show. As they work through their individual parts of the documentary, they work through some difficult parts of their lives, and find new paths for themselves. Minerva reappears to film a scene for the documentary and meet her grandchildren for the first time. This is quite an eventful dinner as paternity is revealed multiple times - yep, you read that right. One revelation usually makes a dinner party, two puts it on the map forever. I enjoyed the book but I felt that the ending wrapped up a little too tidily. I'm not sure that the feelings these girls had for their mother could be resolved so quickly, and even with her explanation, she still didn't do the right thing EVER by her kids.